** I brought home a flat of a half dozen things yesterday and planted them before dark. This morning the temperature was 39 and I wonder if the “tender plants” made it. A fancy fence won’t keep out the cold. Or crows. Or moles. Or cutworms, potato beetles, bean beetles, flea beetles. A garden is a hard and fickle master. ** We walked pass some pokeberry yesterday on our accustomed path around the field and I reconsidered it briefly as a free wild food. I came back to the house and reviewed exactly WHY three boilings are recommended, and have decided the toxic risks are not worth the questionable nutrition. I did learn, however, that the Declaration of Independence was written in fermented pokeberry juice, so I am thus enriched. ** The escaped cows (just remembered I took a picture, still in camera) were in our pasture for two days before the owner just happened to drive by Monday afternoon. “Figured they were just up in our woods” he said, and that he would come back the next day to fetch them home–by which time they were nowhere to be found. Hamburger, anyone? ** Image above: Yellow Mandarin, a common lily of the Mt. Rogers area. Ever seen it? 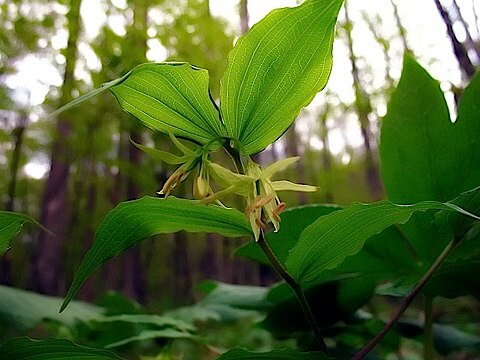 Tiny spidery pale yellow flowers hang underneath the arching plant that looks superficially like another lily common in the same habitat, Solomon’s Seal. **Bending and twisting (translate: gardening) often flares up my lousy muscle condition called Myofascial Pain Syndrome. I was just getting over a bad flare from unloading the donkey poo with a shovel a week ago when we rushed to get yesterday’s nursery plants in the ground. Usually takes a day to catch up with me. Wish I knew a good physical therapist. ** We’re in Netflix Crisis and may end our run of mostly disappointing attempts to find movies both of us will watch from start to finish. I’m easier to please (or at least distract) than she is, but the very descriptive Super Bad was not just the name of the “coming of age” movie I’d expected was more of a guy thing. After fifteen minutes I decided it was a utter waste of time without redeeming moment one. I’m going to look for some recommended movie lists out there, but our tastes are apparently way off the “expert” opinions that make movies into blockbusters for the hoi polloi. ** Words I never imagined I’d hear in one phrase in my lifetime: Platypus Genome Project. My first impression was geewhiz! how neat to know all these interesting phylogenetic facts about the history of this vanishingly odd and rare creature. My second reaction was to rankle a bit at “science for science’s sake” in a time when the world is going to heck in a hatbox. But then, pure science often leads to practical science that makes a difference where people live. Now you know more about me than you ever thought you would! THE Dish…..is a spectacular movie! Kelley’s Heroes….an oldie but a goodie!